Let us help with your new thing. When I tell people that I am a nurse, their response is almost always positive. They will either say, “That is so wonderful! You get to help people!” or thank me for my work and tell me a story about a kind nurse that made a difference in their life or that of their loved ones. I can see them picturing me in white scrubs, holding patients’ hands, and offering comfort to those that need it most. But that isn’t really my reality. I mean, yes, I get to help people. And yes, I often offer comfort for those that are experiencing unimaginable tragedy. But I also am required to take annual Workplace Violence training where I learn to protect myself and escape in the case that I am choked, grabbed, or beaten by someone during my shift. Almost every day that I work, I experience some sort of verbal abuse, intimidation, harassment, or physical threat. You know, just another day at the office. If you’re a nurse or other healthcare worker, this isn’t news. But I bet you aren’t surprised if you experience these things during your regular work day. Sadly, many healthcare workers have grown to accept the abuse that we face almost every hour that we are in the clinical environment. Violence in the workplace has become a massive problem facing healthcare workers across the United States. In a 2014 study, nearly 80% of nurses surveyed reported being attacked while on the job in the last year. That is nearly 8-0 PERCENT. When I asked my non-healthcare worker husband when he was last attacked at work, he paused, looked at me funny and said, “I can’t recall.” This is not a standard concern for those outside of our industry. And I consider myself lucky. I have never really been hurt on the job. Luckily, none of the threats have been acted on. I have seen more nurses and healthcare staff than I would care to think about seriously injured on the job or who have had to leave the medical field all together due to the effects of being a victim of violence in the workplace. The public does sometimes hear about the violence. However, these usually are the most extreme cases, and only the ones that make it to the mass media. You may remember the viral video showing a patient beating on a group of nurses with a pipe pulled off his bed. Or possibly you saw the photo of the ED nurse who was stabbed repeatedly by a patient that she was caring for in the emergency department. Then there is the absolutely tragic story of Carlie Beaudin, a nurse practitioner at the Medical College of Wisconsin, who was violently murdered in the parking garage by the hospital where she worked in January of this year. Only one word comes to mind when I hear about these kind of events – STOP. This has to stop. Nurses are rated one of the most honest and ethical professions in the country almost every year in Gallup Polls. That’s great. Now it’s time to be the most respected. It is time to use our voices to advocate for safer work environments and to share our stories. There are many groups who have already started these efforts. It is time to organize and unify to get workplace protections in place. I have heard stories about hospitals who do not encourage their staff to report incidents of violence or abuse, about nurses being told not call the police when assaulted, and about cultures of “patient satisfaction first” coming before staff safety. Just writing these words makes my eye start to twitch with rage. So, what can we do about it? How do I work to make the violence stop? Below are a list of organizations who have started the work. They are groups that advocate for workplace safety for healthcare workers, provide trainings, support legislation to increase penalties for assailants, gather data to analyze and publish, and provide all sorts of resources from legal to mental health support. Check them out and see which might be helpful for you to get started in your journey to stop the violence against healthcare workers. I also want to make a plug for a new campaign that I am working with – the Raise Your Hand (RYH) Campaign. This campaign was started by nurses and is being led by emergency department nurses to raise awareness, collect data, and provide insight into solutions regarding violence against healthcare workers that occurs in hospitals. We have a brand new website – CHECK IT OUT – where we are gathering stories from nurses and other healthcare workers who have experienced violence in the workplace so that our Research Committee can start to extract data to help us find evidence-based practices to help us combat this epidemic of violence. If you have experienced abuse in the workplace, know that you are not alone, and it is NOT acceptable. We have to work together to create a new nursing reality, really a new healthcare reality, where we can ask each other, “When was the last time that you were attacked at work?” and all respond, “I can’t recall” with a funny look on our face. About the Author - Sarah K. Wells, MSN, RN, CEN, CNL is an educator, speaker, blogger and owner of New Thing Nurse, a professional and academic coaching company for the nursing world. New Thing Nurse is organized to provide support and guidance to aspiring nurses, newly graduated nurses, and veteran RNs looking to make a change in their life. New Thing Nurse wants to help with your new thing! HAVE A NEW THING? CHECK OUT OUR SERVICES. Get the New Thing Nurse Newsletter! Sign up with your email address to receive news & updates about New Thing Nurse. Especially when they’re put up by nurses! The holidays, like Halloween, are one of my favorite times of year to peruse social media to see what kind of crazy decorations that hospital staff (i.e. usually the nurses) have cooked up. This year has not disappointed. Below is a sampling of some of my favorite hospital decorations that I have found on the interwebs this year. Enjoy, chuckle & maybe steal a few ideas (NOT ALL ARE APPROPRIATE - I cannot be held responsible for your choices.) for your own unit. Caution: Most were gathered from big social media accounts sans credit to the originators, so sourcing is hard. If you know the source of any of these gems, PLEASE LET ME KNOW, and I will happily give credit to the creators of these wacky creations. Also forgive me for grainy picture quality. I do my best. A classic urinal wreath with colorful Coban for flair. A darling bedpan reindeer with festive pompoms. 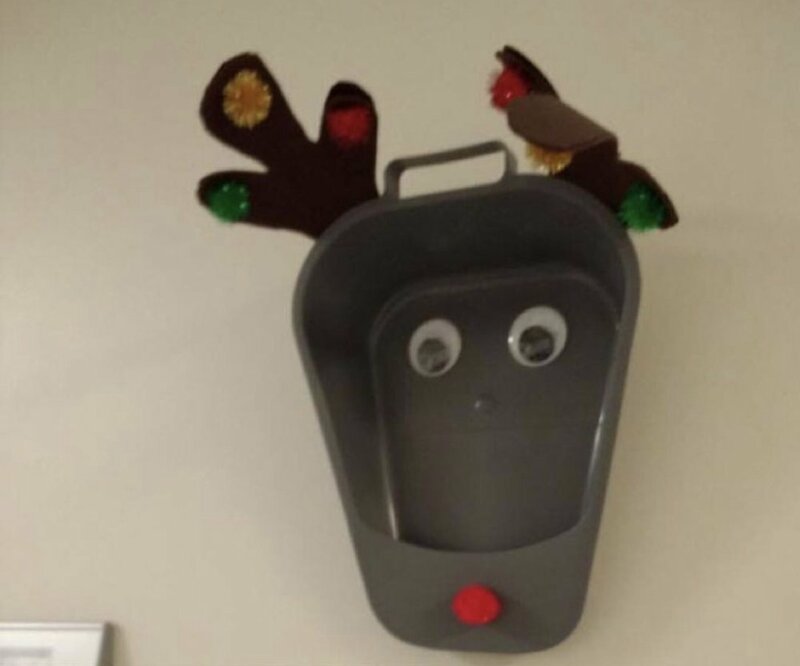 The Combo - bedpan reindeer with urinal wreath + PUN MESSAGE! A personal favorite. CHRISTMAS TREES! Who doesn’t love them? Well you may love them more once they are made from random medical equipment! The IV pump Christmas tree - Where did all the pumps go? This one may look familiar as it was circulating a lot last year, but I still love it. The Condom Christmas Tree - THIS IS MY FAVORITE!!! I don’t know who thought of this or who blew up the condoms (bless you), but this is pure genius. And the flier next to it!! AMAZING! I would love to see this up in my local health department. Safety first, especially with Christmas decor. I don’t know what the Elf on the Shelf guy did to some of y’all, but you are getting BRUTAL on this poor guy. I have never seen so many elves on life support until the last year or two. Elf on the Life Support - I think his sedation needs to go up. And what are those other figurines doing to him?? Elf on the Life Support II - This guy has enough sedation, but WHAT DID Y’ALL DO TO HIM?? And the bigger question - what did he do to y’all? Run, Run As Fast As You…. Wait… - I’m calling it an open fracture and insufficient pain management. This may be my absolute favorite category. Someone, somewhere was prepping for a pelvic exam, looked at that speculum, and thought - REINDEER! What a visionary! And what a strange mind. Either way, there are some incredible variations on whatever was the original. BEHOLD!!! The Glamour Shot - I love everything about this photo. The look of the reindeer, the style of the photo… perfection! The Speculum Sleigh - What’s better than a speculum reindeer? Why 8 of them of course! And Santa looks so excited about it. Don’t you love nurses even more after seeing some of these photos? Or fear them? Either way, you have to marvel at their creativity and craftsmanship. May it never stop. We are back in the Holiday Season again friends, and the flavor of the month is kindness and giving. You see it on commercials, billboards, and soda cans. The hospital is full of potlucks and gift exchanges. You may be getting ready for your holiday party and trying to find the right outfit that is not scrubs or yoga pants. It can be a cheery time when looking from the outside of the unit. But in your department, it is probably a different story. The census is high. Patients are sick. Staffing is short. There is no time to sit, pee or hardly stuff any of that potluck food in your mouth between call lights and IV pumps sounding off. We are all busy in the winter. It’s a fact. Nurses wear their fun scrubs and Christmas light necklaces that shine so brightly, but their mood is dark and cold like the weather outside. Your department has run out of everything – no more sandwiches, personal belonging bags or the good, fitted sheets for the beds. Administration is sending out emails thanking you for all your hard work, but also asking you to pick up some extra hours to fill in the staffing holes. It is easy to get resentful and cranky. These are the days that we see holiday silliness in the emergency department that seems only to arrive in winter – 19 dialysis patients with clotted vascular access in 4 hours, patients with sore throats on a Buy 1 Get 30 Special, and so much epigastric pain (mine included) that it can only be the weeks after Thanksgiving. And you will get those patients that no one wants to deal with but who take an extraordinary amount of time - the homeless men and women who come for what seems like complete BS. Maybe the EMS call will be for a 67 year-old homeless woman who fell and can’t (did not want to) get up or possibly a 46 year-old transient man who is having a flair up of their chronic thumb pain. I agree, this is not an emergency. This is a waste of an EMS rig. We are receiving a person who does not need emergency medical care services. However, I want to take a moment to remind us all that while these people do not need emergency medical care, or possibly no medical care at all, they are people who still need care. These are often the forgotten, the hungry, the cold, the mentally ill, and the individuals that our society is failing. They are not getting the medical or mental health care that they need. They are most likely lacking the absolute basics – clean clothes, a place to shower, decent food, and a safe place to sleep. I had a patient like this yesterday. They needed nothing medically and were definitely taking up a bed that we needed for a sick patient. But as I tried to get them out of the ED, they told me about how much they just wanted a shower and some sleep. They told me how they had been eating out of the trash and scared to sleep because they never know who is around and what they might do. This is not a person who needed any medical care, but they did need someone to care. We tried to help. We gave them clothes and food. We let them wash up. I led them to the waiting room to eat and rest while the ED continued to provide medical care to those who needed it. I finished my shift and went home. And I was frustrated and sad. The emergency department should not have to be caring for the basic welfare of our patients. I truly feel that humans all have the right to clean food and safe housing. And I can’t always make that happen. Shelters are often full. The department doesn’t have enough food to feed everyone a meal. Hospitals can’t be the fixer for all of these problems. But for what it is worth, I know that I can always try to remember to care – to care enough to give each person the most dignified and respectful interaction that I can and to care enough to keep their humanity in mind even during the busiest time of year. Photo: Sarah K. Wells, MSN, RN, CEN, CNL being a giant nerd while speaking at San Francisco ENA’s TraumaCon3. I have a secret that I want to share with you. Promise not to judge me? I am a full-blown Conference Nerd. I have, for years, spent a lot of time and money attending nursing conferences. I love them all, no matter the topic - emergency nursing, pediatric care, pre-hospital, nurse wellness, hospice, burns, trauma. I have been to a lot. I have seen many lectures. I loved every minute of it. Now my conference passion is taking on a new form - I am getting to be a conference speaker!! This conference season, I am SO EXCITED to be presenting at some of my favorite conferences!!! This month, I have already presented at San Francisco ENA's TraumaCon3 (see ridiculous photo above) and will be heading to PIttsburgh, PA next week to present at the Emergency Nurses Association national conference, ENA18!! In October, I will be in Walnut Creek, CA at East Bay ENA's For Nurses, By Nurses Conference. And in November, I'll be heading to Orlando, FL to co-present with my collaborator & favorite human, Allison Shuttleworth, at the ENA Fall Regional Symposium. I am geeking out over here. At ENA18, I will not only will I getting to share the stage with some of my favorite nurse speakers, I will be getting to brag about all of the amazing work that my emergency department has done to enhance the pediatric care for our littlest patients and their families! I love conferences because of the networking, the education and the feeling of camaraderie that you feel among the engaged nurses in attendance. At conferences I'm not a nerd, I'm just one of the gang. Want Sarah to speak at your next event? Contact New Thing Nurse to arrange for Sarah to be your next event’s exciting speaker! Snacks – Once you have coffee, you will need calories. I consumed endless amounts of protein bars while in nursing school. As a nurse, I have switched to straight boiled eggs. Whatever your fancy, pack small meals or snacks to help get you through the day. Your brain needs calories to think. Water – After caffeine and calories, you next need water. Get a water bottle. Like a camel, you need to be able to survive off your own water stores until your instructors tell you that it’s OK to go to the facilities. During nursing school, you don’t know when you will have a break. Another tip – get one with a good lid. My backpack once had an episode of water bottle incontinence and only by the grace of the Patho Gods, did my laptop not get fried. Get a water bottle with a good lid. Tight seal. Enough said. Pens – Black or blue ink is classic and won’t confuse your schoolwork with an episode of My Little Pony. Do not show up to class without pens. Just like at the hospital if you show up without a writing utensil, your classmates may or may not be able to/willing to bail you out with a loaner. I love cheap pens that come in a box for under $20. If you loose them or someone touches it with their poopy fingers, it’s no big loss. Like everybody, I like all the photos of pretty notes in 34 colors, but I just want a pen that writes in the color of A+. Laptop or Tablet – We live in the digital era. Type your notes. It will save you time. If you want to kick it up a notch, find other people to take notes for different classes and then share to make a hive of mega-notes that will carry you all to glory. Teamwork makes the dream work. Watch – You need to know the time in nursing school. Don’t always rely on your phone. Having your phone out all the time makes it look like you’re not paying attention, even when you are. Get a watch. Learn to sneak glances at it while still maintaining direct eye-contact with your professor. This skill will take you very far in your nursing career. Epocrates - This app helped me with all things pharmacology. It contains dosing infomration (adult & peds), contraindications & administration directions for everything. Remember to always read about the meds before you give them. Medscape - Medscape is my resource for every random question that I may have while on shift. I use it weekly now in my bedside care. Most hospitals even have Medscape embedded in their intranet. Use it. Learn it. Love it. WebMD - Another good app for all your random symptom, disease and other medical questions. Patients may use it incorrectly, but it can be a great source of info for clinicians. Taber’s Medical Dictionary - All those big words... what do they mean? Taber's Medical Dictionary will help you find meaning to all the crazy medical terms. NurseGrid - Need to figure out when you and your classmates can get together to study amidst your millions of conflicting schedules? NurseGrid is a scheduling app made by nurses for nurses (and nursing students). Create easy-to-read schedules that you can share with your classmates. It's pretty great. Jacket – You need a good jacket that will carry your through class and clinicals. It’s a fact – universities and hospitals cannot seem to regulate their temperature. It’s usually borderline freezing, even in the middle of summer. Get a comfy jacket to avoid hypothermia throughout your studies and clinical rotations. Bag – You need a nurse bag. It doesn’t have to be crazy or expensive. It just needs to fit your stuff, be comfortable to carry and ideally, waterproof. Why waterproof? Because you never know what funky floor you are going to sit it on in the hospital. Schedule Holder – It is necessary to have somewhere to put your insane school/clinical/study/exam/sleep schedule. But I am not going to use the word “planner” here because I hate paper. I know some people love their paper calendars but WHAT HAPPENS WHEN YOU LOOSE IT?? I like to keep mine in my phone which syncs with my computer. Do as you will. If you need a cutesy, paper planner – DO IT. Just have your schedule somewhere easy to find and hard to lose. Good Attitude – This is essential to get you through school and your nursing career. Nursing school was one of the hardest things that I ever did. It was only because of the members of my cohort that I was able to get through everything. I never would have been able to keep them in my good graces if I didn’t have a good attitude. That will also go for your future colleagues. Healthcare is a team sport and if you are the Debbie Downer or Poophead Paula, no one is going to help you. You cannot nurse alone. Keep a good attitude, and you will be successful. Support Group – I already mentioned my amazing nursing school cohort (SHOUTOUT CNL C/O 2010). But you need more than just nursing school friends to get through nursing because guess what – NURSING SCHOOL ENDS. Your friends will get blown to the four corners of the earth and as much as you will try, you will not be able to depend on them as much as while you’re in school. Set yourself up for success and find a good support system outside of school. Family, friends, partners, pets – it doesn’t matter who as long as you can talk to them and depend on them for support and love. Nurse Mentor – I waited too long to find one of these. A nurse mentor is someone who has been where you are going and can guide you towards success They are there to listen to you vent, get peppered with questions, and received yours texts in the wee hours of the morning (WARNING – there are no promises on their response time). If they do not know the answers, they will help you find them. They are a shoulder to lean on and help you through the hard days, because there will be many, during your nursing school journey. That’s it! The Down and Dirty Nursing School Supply List from New Thing Nurse! There are many other things that will help you along the way - like scrubs and stethoscopes. However these basics will get you through the hard that is nursing school and set you up for success as you chase that RN dream! Feel like you might need more help during school than just a supply list? New Thing Nurse offers Academic Advisement and Career Mentoring services to help provide support and guidance to nursing students as they wade their way through the chaos of class and clinicals. or contact New Thing Nurse directly. We respect your privacy. Your information will not be shared with third-party companies. This is an actual photo of Sarah K. Wells, MSN, RN, CEN, CNL, owner of New Thing Nurse, when she started her nursing career. Author's Note: A New Thing Nurse follower recently asked me what advice I would give to a new nurse starting their first nurse job. This post is inspired by her and all the recently minted, new nurses who are starting their nursing careers! Congratulations to you all! Are you a new grad nurse starting your first job? Here are some tips to take with you to work to make things go a little easier. 1. Be open to learning. – There will be so much to learn, and you can’t learn it all at once. Be open to days where you will learn a lot and other days where you may learn only a little. The important this is just to stay open to learning. If you close your mind to learning, you will never grow into the best nurse that you can be. 2. Ask all your questions. – There are seriously no bad questions. Lives literally depend on your work, so ask anything that pops in your head. Off-the-cuff tips and advice that I received from co-workers over the years have saved my behind so many times. Pepper your preceptor and colleagues with your questions and absorb all of their pearls of wisdom that you can. 3. Document everything that you do. – The old adage is absolutely true. If you didn’t document it, it never happened. If people are rushing you and telling you that you do not have time to document, remind them that it’s part of your job. There will be a time where you have to learn a good pace to balance patient care and documentation, but it’s an essential part of nursing. 4. Be kind to everyone you work with from the housekeeper to the CEO. – You never know who will save you on a busy day in the future. Frequently it’s the frontline staff that will help you the most in a pinch, so be kind to all. 5. Remember that healthcare is a team sport. – Always be willing to help, as well as ask for help when you need it. No one can do this job alone. If you have a spare minute, make a bed or clear some trays. The good you put out will always come back to you. And most importantly – TAKE CARE OF YOURSELF. Nursing can be hard. Don’t fall victim to burnout by setting too high of expectations as you start your career. Make time for self-care and find a good support system. You will a need a tribe to thrive. Good luck! This will be hard, but you are joining the most amazing profession. And know that the #newthingnursetribe will always be here for you every step of the way. Anxious about getting started at your new job?